While you may be forgiven for thinking this article is going to discuss the different sort of bruising one gets from getting involved with a bout of fisticuffs, the reference of blacking and blueing, in actual fact relates to a process for ferrous metals, which is designed to provide a level of corrosion resistance, while improving its appearance and minimising light reflection. There are a number of different processes by which this can be achieved. 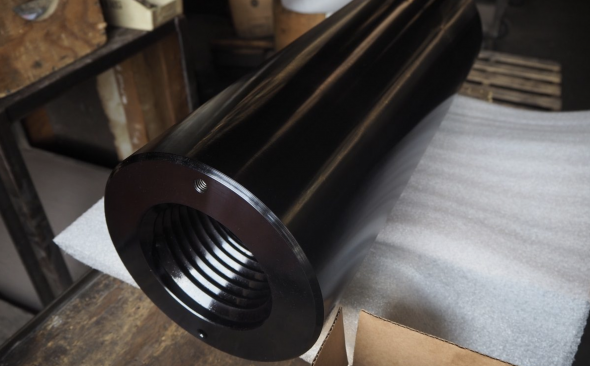 Blacking generally relates to black oxide, otherwise known as magnetite, being used in a process to provide a conversion coating for metals like copper, zinc and stainless steel among others. Magnetite is more stable on the surface then red oxide or rust, and in modern industrial approaches uses hot and mid-temperature processes, though a cold process is also available. Hot black oxide works with a solution of sodium hydroxide, nitrates and nitrites to convert a material’s surface into magnetite. The part to be treated is dipped into various tanks to ensure it is totally clean, before being blackened with the blackening compound, which bonds chemically to the metals surface, creating a porous layer. Oil is then applied, which sinks into the porous surface and subsequently prevents corrosion. Mid temperature black oxide also converts the surface to magnetite, but at temperatures just over the boiling point of water, but below the boiling point of the solution, which is advantageous as it produces no fumes. Cold Black Oxide, applied at room temperature is actually a deposit of copper selenium compound as opposed to an oxide conversion coating, and requires an application of oil, wax or lacquer to achieve full corrosion resistance. A newer option in the UK offers room temperature blackening with Blackfast, leading metal blacking specialist who uses a cold temperature process, which does actually provide a surface conversion process for stainless steel. Blueing is a process used to protect steel against rust and gets its name from the blue-black colour of the resulting protective finish. Again, there are a variety of processes, with True gun blueing using an electrochemical process to create the conversion coating of magnetite. The Blueing “hot” process, known as “traditional caustic black” was adopted by many firearms manufacturers, as it was very economical for large-scale applications and provides a very good rust resistance. The best rust and corrosion protection are found with “rust bluing” and ”fume bluing” as the process continuously converts any metal that could possibly rust, into magnetite, and is the only process which is possible to use on vintage guns. As older firearms use a soft solder to connect the various parts, alternative processes involving heat can weaken the soldered joints, thus making the gun potentially dangerous to use. Blacking and Blueing have historically mostly been used by firearms manufacturers, to improve the cosmetic appearance of the weapon, while giving it corrosion resistance, and reducing any glare off the barrel, while a shooter is taking aim. It also has found uses in the kitchen in seasoning cast iron cookware, to render it corrosion proof and non-stick. Many hobbyists to this day practice various methods, though the debate about which one is best has yet to be concluded.